A farmers' union is "astonished" by a report which named a traditional Welsh dish as the iconic British meal with the highest carbon footprint. A World Wide Fund for Nature report said a bowl of lamb cawl produced the same amount of carbon as boiling a kettle 258 times. National Farmers Union Cymru said the report did not acknowledge "benefits to biodiversity of grazed livestock". The report also warned climate change could risk the future of the dish. Cawl is made with lamb, leeks, onion, swede, carrots, parsnips and potatoes. Hedd Pugh, NFU Cymru rural affairs board chairman, said: "We are astonished at the nature of this report that draws comparisons between lamb production and the action of turning a kettle on. 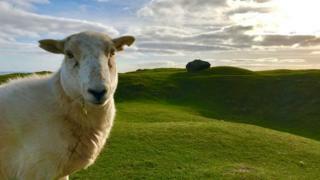 "Welsh farmers take their environmental responsibilities extremely seriously and the industry is constantly striving to become more efficient and productive in line with the goal of meeting our climate change obligations." Sardines and chips to replace cod? The WWF studied the impact of four classic dishes - lamb cawl, chicken tikka masala, ploughman's and fish and chips - which could disappear or change as a result of climate change. Warmer seas could see populations of cod dwindle and see the fish replaced with cheaper options such as anchovies. The price of chicken could also suffer from rising temperatures, the report said, as soy production, which is used to feed them, could be hit significantly by warmer air temperatures and changes to rainfall. Gareth Redmond-King, head of energy and climate at WWF said: "The threat to these classic dishes just shows that climate change could impact every aspect of our lives in future if we don't act now. "If each of us takes a small action, together we can combat climate change and future-proof our best-loved dishes." The two men have been taken to Musgrave serious crime suite.